There are hundreds of specific varieties of blackberries. The name is often used as a generic term that refers to a wide range of bush berries that are considered blackberries. When ripe, blackberries have a deep ink sheen and their flavouring is sweet, slightly tart with earthy undertones. 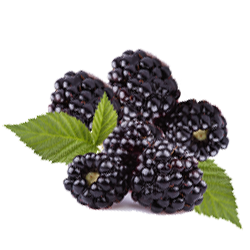 Blackberries contain numerous large seeds that contain oil rich in omega-3 and -6 fats as well as protein, and dietary fiber. This fruit is a popular use for desserts, jams, jelly, and wine.